Once the salmon season has ended most anglers put away their fishing gear for the winter. Some will try their luck at steelheading and some head for the fly tying vise. Spring arrives and those who headed for the vise will try their luck at some local cutthroat fishing until ice off on the interior lakes while others wait for the arrival of the Fraser River salmon in June. Many anglers are beginning to discover that the rods never need to be put away, the fresh water Marlin (sturgeon) are abundant year round. 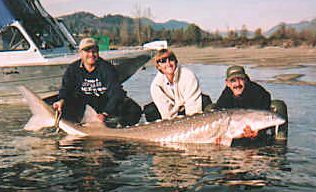 Sturgeon can be found throughout the Fraser Valley, the Fraser river, Harrison Lk, Pitt L, Pitt River, Stave R and some tributary sloughs have sturgeon. These fish can be caught all year though best fishing is between March & November. It is believed that at some point in the life cycle, larger sturgeon migrate to the ocean and will travel to other river systems and ocean estuaries. As to why they do this, there is much speculation about sturgeon habits, not much is known about this prehistoric creature. Sturgeon are beginning to show up in rivers that have never had sturgeon before. One is the Somass River on Vancouver Island; since 1990 reports of sturgeon tangled in native nets have been reported. 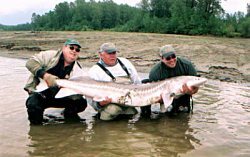 A few years back, a tagged Columbia River sturgeon was recaptured in Alaska. It is thought that these migrating sturgeon will return to their native river for peak fishing periods and spawning. 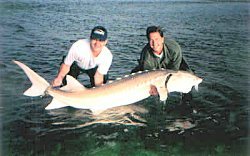 There are two major feeding periods when sturgeon fishing is at its best; April- June and September- November. During the winter months most fish being caught are smaller, 2 to 4 feet is average. Once spring sets in, larger fish begin to migrate from Upper Fraser, Harrison L , Pitt L and the ocean awaiting the arrival of the eulichan. In April the annual migration of the eulichans begin. This is the first opportunity for some serious feeding by both small & larger fish. Size average will increase to 3-5 ft, and chances of catching those monster trophy size fish are very good. The second major feeding period is when the sockeye salmon enter the Fraser, the sturgeon will strategically place themselves below popular fishing areas and will feed heavily on salmon parts discarded by anglers. They will also feed on salmon eggs and whole live and dead fish. This is the last major feeding period before winter sets in and food becomes scarce so feeding periods are long and fish are very aggressive towards good baits. 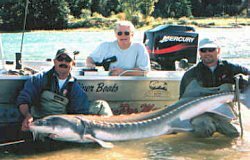 There are two ways to fish for sturgeon; from a boat or from shore. Rods and reels used are different for each method. Boat rods are usually shorter, 6-9 ft one piece rods with a levelwind reels capable of holding 250- 300 yds of 60- 100 LB test. Shore rods are 11- 13ft two piece with large spincast reels. The reason for the longer shore rods in a spincast configuration is castability, these longer casting rods can launch 12-20 ounces of weight half across the river. Once you've hooked a fish you will have plenty of backbone to fight and land a large fish. The rigging used from shore is slightly different, we use a three way swivel attached to the mainline with the weight attached to the bottom and leader to the middle. When fishing from the boat the rods are placed at the rear of the boat, the lines are strait back or slightly off to one side. We use San Francisco sliders which is a tube made from plastic with a snap attached. The mainline runs through the tube and tied to a swivel. Then the leader is attached to the opposite end of the swivel. Place a bead between the slider and the swivel to allow free movement of the swivel. With this type of setup the line runs strait through the slider directly to your bait. The weight sits on the bottom only moving once the hook is set. Mainline is either monofilement or dacron 60-100lb test and leader strength should be slightly less than the mainline. I prefer 100 LB Tuffline for mainline and 60-80 mono or dacron for leader. The Tuffline is a smaller diameter line but maintains superior strength and allows more line capacity on your reel than mono. Hook size should match the size of bait being used, 5/0 to 9/0 is the standard. Keeping your hook sharp is important due to the hard sucker like mouth made mostly of cartilage. Baits and location are of great importance to the angler. Using a bait that's not present in that area is less likely to produce large fish than using baits that are. During the spring we use eulichans, lamprey and ditch eels, the later two can be used throughout the river where the eulichans are used below Chilliwack down to the mouth of the river. Other baits like headless finn fish, sandshrimp and dew worms can also be used throughout. The fall fishery provides good fishing with many baits Salmon gills, salmon roe and the baits mentioned above all work. Fishing a variety of baits is the key to finding what's working best that day. Sturgeon are bottom feeders. They spend most of their lives cruising in and out of deep holes in search of food. The river bottom provides good structure and food sources through these deeper holes. Natural food will drift down river dropping into and resting on the bottom. I like to fish several locations in and around these larger holes. Start by anchoring your boat well above a deep hole. Fish the flats leading into the deeper water, then re-anchor just above the deeper water so your bait lies along the drop off area leading into the hole. Your third anchor drop should be in the deepest part and the four drop at the back of or leading out of the hole. This allows you to fish the area thoroughly covering all locations fish might be actively feeding. If you're fishing the lower area of the Fraser where tide changes occur, try fishing 2 hours prior and 2 hours after a high tide for your best bite times. The barometer also affects fish feeding patterns. A sudden drop in baromic pressure will stop the larger fish from feeding until stabilization which occurs in 24 hours to 48 hrs. The drop in pressure doesn't seen to affect smaller fish and a rise in pressure affects neither. One of the most common errors sturgeon anglers make is setting the hook too early. You must be patient. Wait for the bite to be a steady pulsating pull, not small quick pulls. If you can't stand to watch those small quick bites try picking up the rod and holding it. Wait until the rod is being pulled steadily down. Drop your rod tip as the fish is pulling down then pull up setting the hook with authority. Patience is the key to success. Sometimes the fish will give a couple small tugs then nothing. Don't reel in your rod, just wait and he will return for another taste. When fishing peak feeding periods such as the Spring Eulichan migration, bites can be ferocious. A good rod holder is a valuable tool; one with a large enough opening to allow you to pick up the rod when a fish is spooling line. Equally important is a fighting belt made from leather or plastic They help tremendously when trying to reel in a large fish and also work well for the younger kids when fishing for salmon. Last, but just as important as any tool, is a lasso for landing large fish. It should be made from a soft material that leaves no scares. We are so fortunate to have all the angling opportunities we have in the Fraser Valley. We must continue to practice good river edict and release practices to ensure our fisheries future. Many people spend countless hours behind closed doors negotiating for your right to fish, to ensure angling opportunities exist in the future. There is a proposed bait ban for the Fraser River. As of Aug 31/99 which will affect your ability to catch Sturgeon. The Fraser Valley Salmon Society is one group of many who dedicate their time to protect the rights of anglers of all denominations and species. By joining one of the many groups your name will be counted and your voice can be heard, if you so wish. The fishing industry is going through dramatic changes and we the sport anglers are now beginning to get the recognition we've lacked for many years. Now more than ever we need all sport anglers to be counted. By putting your name on a piece of paper, you would be helping yourselves and those working hard, to preserve your ability to fish in the future. Goodluck and we will see you on the river!